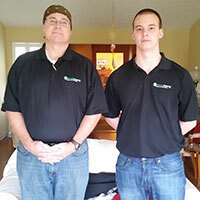 Welcome to Garage Experts of Cincinnati – co-owned and operated by John H. Baldwin and Matthew J. Hobbs. We are both proud and excited to bring the Quality and History of Garage Experts to the Ohio area. Garage Experts is a national company backed by a reputation for superior quality and work. Garage makeovers, lifetime warrantied epoxy flooring, design and storage solutions to provide protection, functionality and value to your garage. John and Matt both bring a strong since of Quality and ethics to this market. Customer service and trust might sound cliché these days but we both promise to provide these. Please give us a call and let us find a solution to your needs. GarageExperts of Cincinnati is your local garage makeover expert. View some of our recent work.